It was a Christmas Eve, 24th December. Dilip, HR Manager, Prospecta Engineering (Prospecta), was having a casual chat with his colleagues, at the office of Ranjit Kamat (Ranjit), the factory manager. The next day was a holiday for Christmas and then there was a week-long season of festivities culminating in the New Year’s Eve party. Everyone was in a holiday mood, looking forward to the evening party. The office peon walked into the office with the mail and handed over a letter to Dilip. It was a sealed envelope bearing the emblem of Workers’ Union (WU), a firebrand union, very active in Maharashtra, India. I. What challenges did Dilip and Ranjit face and how did they arise? II. What were the actions taken by Dilip, Ranjit and the top leadership of Asian and Prospecta? III. List the challenges faced by Dilip and Ranjit on the expectations articulated by Arjun about the wage hike. This caselet deals with the challenges facing Dilip, HR Manager at Prospecta Engineering (Prospecta), a manufacturing company located in the industrial belt at Bhosari, Maharashtra, India. Rakesh Sinha (Rakesh), a businessperson (currently designated as Director Operations), with multiple businesses to manufacture auto ancillary parts, floated this company. However, the venture was not very successful due to lack of capital, technology and management capabilities. Hence, Prospecta was forging an alliance with Asian Engineering Limited (Asian), a leading automotive equipment manufacturer to turn around its fortunes. Dilip was deputed to Prospecta along with Ranjit (Factory Manager) from Asian with the desired management expertise, to improve the functioning of the organization. The wages at Prospecta were very low and it had a large population of contractual workers who were not governed by a proper process in accordance with the applicable industrial legislation, which led to a majority of its workers joining a politically motivated external union, Workers’ Union (WU), as its registered members. Asian viewed this as a major obstacle to their proposed growth strategy and feared the spill-over of external unionization and industrial unrest into their factories. Sharad Sathe, HR Director, and Andy Roberts (Andy), the Managing Director of Asian, deployed Dilip and Ranjit to ensure that external unionization did not succeed. Dilip and Ranjit had to deal with the formation of the internal union by managing various groups/factions among the workers and getting them together. These workers had some expectations from the management, relative to the promises made by WU. Dilip and Ranjit had to operate within the negotiation framework laid down by Andy. However, Rakesh complicated the situation by unilaterally declaring a wage increase of 10% in the current salary levels. This shifted the base level being considered for the wage negotiations and increased the expectations of the workers. Dilip and Ranjit now had to decide how to manage the negotiations. The caselet presents dilemmas pertaining to group behavior, power issues, conflict management and negotiation strategies in the context of a dynamic industrial relations situation. This caselet can be used in Executive Development Programs and MBA programs dealing with Organizational Behavior and Industrial Relations. It can also be used in the General Management Courses as an introduction to the challenges of external unionization in emerging economies such as India. III. List the challenges faced by Dilip and Ranjit on expectations articulated by Arjun about the wage hike. Assignment Questions I and II facilitate understanding of the context in which Dilip was operating, by studying the situation and the effects of group behavior, the tactics followed by the union, the management, influencers, etc., within the organization, on the outcome. The instructor can ask the participants to explain the challenges faced by Dilip and Ranjit, and the objectives and parameters specified by the Managing Director of Asian. He can record the responses on the board and then classify them under various headings. The instructor can also ask the students the broad reasons that gave rise to these challenges and record these reasons too on the board. 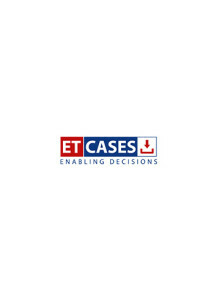 This caselet deals with the challenges facing Dilip, HR Manager at Prospecta Engineering (Prospecta), a manufacturing company located in the industrial belt at Bhosari, Maharashtra, India. Rakesh Sinha (Rakesh), a businessperson (currently designated as Director Operations), with multiple businesses to manufacture auto ancillary parts, floated this company. However, the venture was not very successful due to lack of capital, technology and management capabilities. Hence, Prospecta was forging an alliance with Asian Engineering (Asian), a leading automotive equipment manufacturer to turn around its fortunes. Dilip was deputed to Prospecta along with Ranjit (Factory Manager) from Asian with the desired management expertise to improve the functioning of the organization. The wages at Prospecta were very low and it had a large population of contractual workers, who were not governed by a proper process as per the applicable industrial legislation, which led to a majority of its workers joining a politically motivated external union, Workers Union (WU), as its registered members. Asian viewed this as a major obstacle to their proposed growth strategy and feared the spill over of external unionization and industrial unrest into their factories. Sharad Sathe, HR Director and Andy Roberts (Andy), the Managing Director of Asian, deployed Dilip and Ranjit to ensure that the external unionization did not succeed. Dilip and Ranjit had to deal with formation of the internal union by managing various groups/factions among the workers and getting them together. These workers had some expectations from the management, relative to the promises made by the WU. Dilip and Ranjit had to operate within the negotiation framework laid down by Andy. However, Rakesh complicated the situation by unilaterally declaring the wage increase of 10% in the current salary levels. This shifted the base level being considered for the wage negotiations and increased the expectations of the workers. Dilip and Ranjit now had to decide how to manage the negotiations. The caselet presents dilemmas pertaining to group behavior, power issues, conflict management and negotiation strategies, within a dynamic industrial relations situation. This caselet can be used in executive development and MBA programs dealing with organizational behaviour and industrial relations. It can also be used in general management courses as an introduction to the challenges of industrial relations and employee unionization in emerging economies like India. The caselet is also useful for understanding the dynamics of group and intergroup behaviour.